Ortley Beach is an unincorporated area of Toms River, New Jersey. It also known as Dover Beaches South. 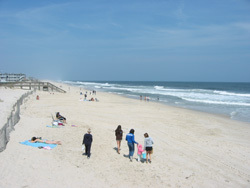 Like many of the ocean communities found on Barnegat Peninsula it is not that large. 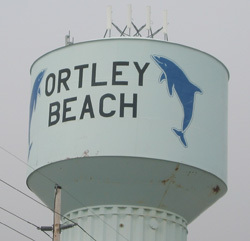 Ortley Beach is less than a square mile in area and is bordered by Lavallette to the north and Seaside Heights to the south. There are ~ 1,600 full time residents - and each is outnumbered many times over during the busy summer tourist season. This website will help you plan a trip to and find your way around Ortley Beach. You can use the navigation tabs to jump to particular topics you find interesting or just keep reading to find out more about this wonderful beach community. There are two pay-to-play beaches: the public beach managed by Dover County and the beach that is in front of the Surf Club. Find out all about the lifeguards, access, fees, and parking at the Ortley Beach - Beach page. 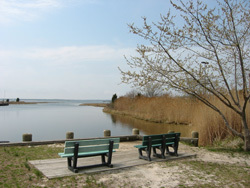 There are many homes that have access to the bay right from their backyard. If you not in a bayside home there are public docks, private marinas, and numerous parks along the bay that are within easy reach of anywhere you may be staying in Ortley Beach. What else can you do when you you need a break from the beach? There are plenty of options. Do you need to do something with the kids? 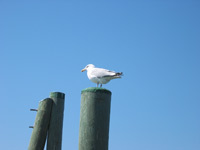 How about Barnacle Bills, the Dover Township Bay Park, or renting a bicycle and riding along Bay Boulevard. If it is just you and your friends - perhaps you want to check out the Surf Club or head to another neighboring nightclub. Do you want to go out for something to eat, get the fixings for your barbeque, or need to fill the refrigerator your one week family vacation? There are plenty of choices in and around Ortley Beach where you can get just what you need. If you are need a motel room for a weekend or a house for a month, you can find something to fit your needs in Ortley Beach. The Episcopal Chapel is the only house of worship in Ortley Beach. There are other churches nearby in Lavallette and in Seaside Heights.